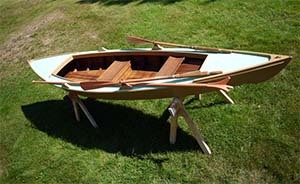 Featured in Building Classic Small Craft Vol 2, by John Gardner. Interior set up for single fixed seat rower with foot braces and single set of oar locks. Aluminum fixed skeg provides excellent tracking. Material is amazingly tough and condition is excellent. A portion of proceeds from the sale will benefit MITA. For more info, see full listing HERE. Arc bottom. Just repainted and refinished inside. Built as a replica of a boat in the Chesapeake Bay Maritime Museum. For rowing and poling. Atlantic White Cedar, Hackmatack grown knees. Very light for traditional construction, around 100 lbs. Oars and 12' push pole and two movable seats. 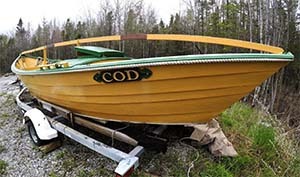 A really fun boat to row or pole. Email me for more photos of the Skiff. 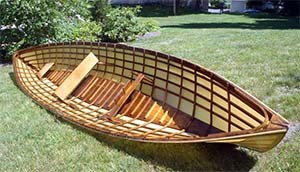 I’ve also got a traditionally built Rushton Wee Lassie that needs a little work. 24 lbs. Price? I don’t know. I’m still torn about selling this one. Let’s talk.